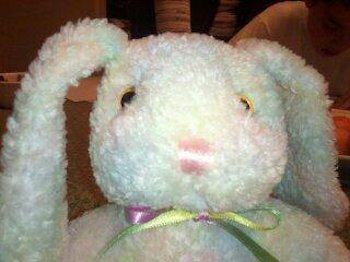 I’m looking for an approximately 9-12 inch long plush multi-colored pastel bunny with a multi-colored pastel thin bow around the neck and black eyes with gold around the outside. My 5 year old daughter, unknowingly, left her bunny at our hotel while on vacation in August. All attempts to find bunny have proven futile. She is so heartbroken, and I want to find a replacement without her knowing. She has been writing bunny notes telling him how much she misses him and when is he coming home. Found him! If your daughter is suspicious that he’s “not the same” bunny, you could tell her he went to the spa so that he could look nicer. I’m not sure if this has been found but I think I saw him at a Goodwill today. I can go back to get him if he hasn’t been found yet but am leaving on vacation tomorrow at 6AM so didn’t want to make a special trip if he’s already been found. If somehow you could let me know that would be great!